Product #16232 | SKU TAB016CAN | 0.0 (no ratings yet) Thanks for your rating! 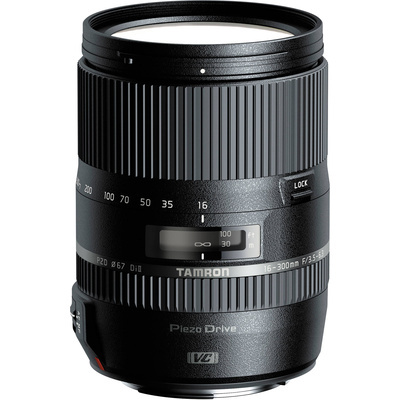 The Tamron 16-300mm f/3.5-6.3 Di II VC PZD MACRO Lens for Canon is a wide-angle to telephoto zoom lens for Canon EF-mount APS-C cameras that feature a versatile 35mm equivalent focal length of 25.6-480mm. This provides users with an extremely wide-angle and super telephoto lens in one convenient package. Also, it has an aperture range from f/3.5-6.3 to f/22-40 across the zoom range. The 16-300mm is also capable of decent macro capabilities with a reproduction ratio of 1:2.9 when zoomed in to 300mm. This is due to a minimum focus distance of .39 m. Also, for excellent image quality, numerous special glass elements are used in the lens design. There are one Hybrid Aspherical element, three Moulded-Glass elements, two Low Dispersion elements, one Extra Refractive Index element, and one Ultra-Extra Refractive Index element.